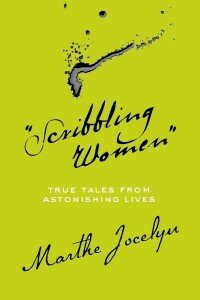 Today’s blog post is officially part of Marthe Jocelyn’s Scribbling Women book tour. That means that anyone who comments on it gets entered into a draw by Tundra Books to win a complete set of Marthe’s books! You can find more information, and a list of the other participating blogs, here. The first time I heard Marthe speak was last November, when she was the keynote speaker for CANSCAIP’s Packing Your Imagination conference. I wrote a little bit about it here. My favourite line, still, was when she said that for a writer, lies are as important a tool as an eraser. That’s a strange introduction to an interview, isn’t it? But I’m pretty sure Marthe was telling the truth here. You can decide for yourself. Read on for what she has to say about letter writing and online platforms and growing up around the stage. ET: I remember from your PYI talk that you grew up around the Stratford Festival — did the stories there influence you in wanting to write? MJ: I wanted to be an actress when I was very young, possibly because the writer was not as visible a part of what I watched and loved on stage. After a brief effort, I gave up the idea of acting, due to serious shyness. Possibly that is when I started to pay attention to the other ways I might participate in theatre. I have written two plays — one for child actors and one for a child audience — but the main trickle-down learning from the stage to my novels is probably the realization that dialogue is far different from conversation. It should be moving the plot or enhancing the characters. ET: Were there some actors (especially women, since we’re talking about “Scribbling Women”) who showed you how characters could come to life? MJ: I was a big fan of Martha Henry, initially because of her name and later because she was a great stage actress. I used to wait for her outside the (Stratford Festival) stage door, even if I hadn’t been to see the play. I still have numerous programs with her autograph. ET: In your foreword to Scribbling Women, you mention coming across the letters of Lady Mary Wortley Montagu, and that her letters inspired you to look for other women who wrote. You also make the point that the physical act of writing intrigued you — when did these women find the time to put their words to paper, given all the other things that they had to do? Do you think that, in writing, they (or we) are hoping to leave something behind to connect with future generations? MJ: Of the eleven scribblers in my book, four were consciously attempting to connect with and pass along to future readers; Harriet Jacobs was a runaway slave who wrote a memoir for the purpose of revealing the trials and abuses suffered by the community of slaves that she’d grown up amongst. Isabella Beeton and Mary Kingsley each wrote books about her own particular passion — homemaking for Mrs. Beeton, and West Africa for Mary. Doris Pilkington-Garimara wrote memoirs about her mother’s and her own life as members of Australia’s Stolen Generations. Nellie Bly was a journalist, concerned with the immediate, and all the others wrote private documents that they would be astounded to know are being read by the general public today. ET: As a writer, how do you structure your time around writing? Do you ever think about why you do it? MJ: I don’t really think about why I do it except that it’s one of the few things I know how to do AND like doing, in exchange for money. Structuring time is one of the big challenges. I make a to-do list every morning. I put a time beside each item. I get about halfway through the day on schedule and then I make excuses and change my mind and do an errand or read for awhile… and then I try to write some more. ET: Some of these women were writing letters, wanting to share their stories with their friends and family. That was a practical thing, of course — back then, there was no other way to communicate with those who were far away. Still, there’s something interesting in that urge to share narrative in the form of long letters. Nowadays we don’t tend to do that. We share little blips at a time — email, tweets — and because the liens of communication are always “on,” there’s less of an impulse to step back and think about what the story of the past week/month/year has been. ET: Are you a letter writer? MJ: I used to write letters, before email, and I still manage the odd thank you note or condolence letter. But what is sad for the archives (fewer letters for historians) certainly makes for a livelier, if more vacuous, social life, with daily communication instead of monthly or even yearly with some distant friends. ET: As a writer, do you put a lot of time into building your “online platform” (blogging, tweeting, etc.)? MJ: No, not much. I’m learning, but it’s a bit too time consuming to make the commitment to using the “online platform” to its full extent. ET: I liked the point that you made in your book about email not leaving behind any artifacts, like a scrap of cloth or a lock of hair. There’s the loss of handwriting, too. Seeing the shape of someone’s letters on paper can help us form an impression of them. When we type, all our letters look the same. Did writing this book change the way that you feel about writing and communication? MJ: I was already a believe in writing, so I can’t say that has changed, but possibly my definition of “writing” has expanded. Even the women who were nearly illiterate and certainly not literary managed to tell profound stories and to reveal their spirit. And I found it intriguing that even women who were nearly illiterate chose, perhaps urgently needed to express themselves using words. I should explain that by “interview,” I mean that I sent Marthe a rambling email filled with questions and observations, and she somehow managed to make sense of it all. Thank you, Marthe! Please don’t forget to comment, so that you can be entered for your chance to win a set of Marthe’s books! I’d love to hear about the Scribbling Women who inspired you to write, or about your views on letter writing versus email. Or how you approach writing in your own life. 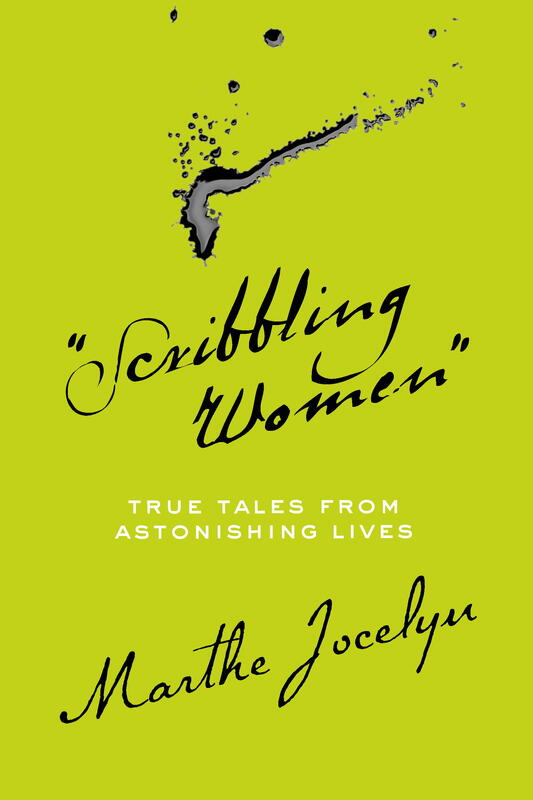 And when you do have the chance to read Scribbling Women, please share your thoughts! I look forward to hearing them. ← Scribbling Women: who inspired you to write? This sounds like an amazing book — every woman deserves to have her story told. I’m looking forward to reading it. I am jealous that you heard Marthe speak. I think she would be so interesting to listen to. She was wonderful! Actually, the PYI speakers usually are. If you ever happen to be in Toronto in early November, it’s a great day! LOVE her book Mabel Riley – fun interview, thanks for posting! I haven’t read Mabel Riley yet — it’s on my to-read list. I loved Folly, though. Thanks for your comment! One of the things that I am really enjoying about this tour is that everyone has asked Marthe such great questions and I am finding some great new blogs. I’m looking forward to reading more of your posts! I was fascinated by Toni Morrison’s account of writing with her infant on her lap at the kitchen table. Or Tillie Olsen’s poem about stopping in the middle of writing a poem in order to iron. I’d also like to see a follow up to this book. More Women Scribblers. That’s a brilliant idea, and two wonderful examples! Running out to get the book. Will love it. Marthe’s an inspiring scribbler, too.Thanks for Q &A. Glad I took time today day for reading Lena’s blog. I hope you enjoy the book! Marthe is inspiring, isn’t she? And I’m really glad you read Lena’s blog — she should have been doing this years ago, she’s great! One of the challenges of a blog tour is to answer questions and post opinions that differ enough from blog to blog that the readers don’t get bored and give up. It really helps to have varied questions! Thank you, Erin! Thank you, Marthe! And thank you for all your wonderful answers! I read Incidents in the Life of a Slave Girl by Harriet Jacobs in university and was so moved by her story and her writing, but many of the women Marthe mentions I hadn’t heard of before. I really look forward to reading about these scribblers! I hadn’t heard of most of them either — it’s a fascinating book. I think you’ll like it! it s nice to be able to keep in touch so easily nowadays but it is kind of a shame to lose as marthe says ‘the physical act of writing.’ what will be the cyberspace version of bits of paper, lists and notes to oneself? You’re right. Tweets are a bit like little scraps, aren’t they? I wonder how long they live online. I have a box of old letters in my basement that I keep. I only burned some old love letters. Today I send postcards on a weekly basis. I love knowing that someone is going to smile when they open their mailbox only expecting bills. I really enjoyed your post. Thank you! I have heard that there was a plan to gather up all of the tweets from Twitter and save them for future generations. Some tweets are quite inspirational…others, not so much…. I like writing letters. I try to correspond with the older generation in my family via snail mail and they send me letters back. There is something so personal about seeing a person’s handwriting…. Thanks! And I think you may be right… there are some Tweets out there we might not want saved. But then, maybe that’s the point of it, right? To give an accurate picture, like a window into life at the time, whether or not it shows what we want it to show.